The system works with the existing Axa Connect system from Axa and Conneqtech, and associated apps for iOS and Android. The collaboration means that Vodafone provides sim cards for the system to ensure that the bikes are always connected. The connection runs via 2g, Bart Visser of Conneqtech tells Tweakers. Vodafone is currently working on nb-iot, a network standard aimed at applications like this. “At the moment, research is being done with nb-iot, but national and European coverage is not yet available.” The bike is also equipped with Bluetooth 4.0. The locks are modules that are mounted in the bicycle. 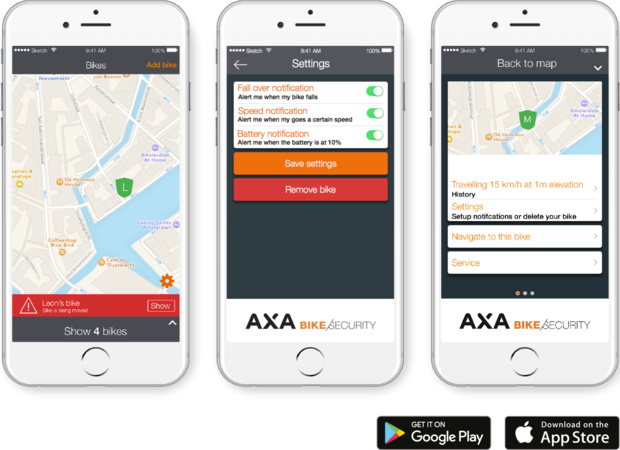 Axa Connect protects the bicycle because users put a virtual fence around the bicycle. If the bike comes outside this area, the user receives a signal. This also happens when the bike goes faster than fifty kilometres per hour, because Axa suspects that in that case it may have been loaded into a van. Ten thousand Sparta-branded bicycles will be fitted out with the Vodafone SIM cards. These are SIM cards that offer European coverage. The bicycles will go into production in early 2017. The service costs money, but can, for example, be included in a bicycle insurance policy.